Summer is a good time to try new recipes. So I will be sharing with you every week a recipe from the kitchen of some of my friends. 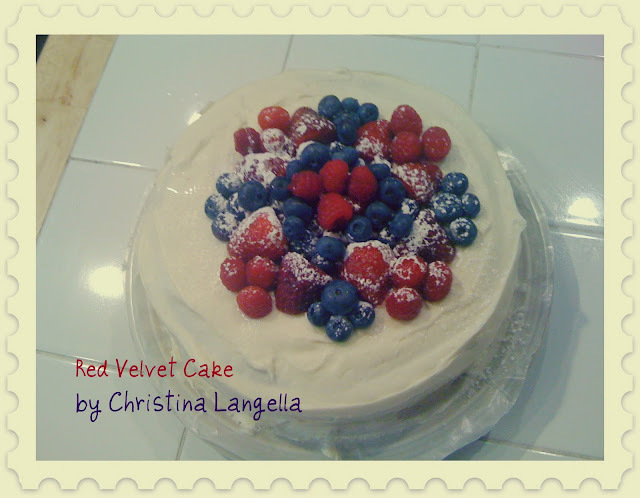 This week Christina shares with us her recipe for Red Velvet Cake with Cream Cheese topping. This is, hands down, the moistest Red Velvet cake recipe I’ve ever made. I discovered this recipe, adapted from the New York Times Heritage Cook Book, a few years ago on a blog called Pinch my Salt. I’ve done it a few times and my only variations, if you will, are that I use shortening (as the original recipe calls for) instead of butter. 1. Preheat oven to 350 degrees. Butter and flour two 9-inch round cake pans. 2. Sift together the cake flour, baking powder, and salt into a medium bowl; set aside. 3. In a small bowl, mix food coloring and cocoa powder and set aside. 3. In a large bowl (using a hand mixer or stand mixer) beat butter and sugar for about 3 minutes until light and fluffy. 4. Beat in eggs, one at a time, then beat in vanilla and the red cocoa paste, scraping down the bowl with a spatula as you go. 5. Add one third of the flour mixture to the butter mixture, beat well, then beat in half of the buttermilk. 6. Beat in another third of flour mixture, then the second half of buttermilk. 7. End with the last third of the flour mixture, beat until well combined, making sure to scrape down the bowl with a spatula. 8. Make sure you have cake pans buttered, floured, and nearby. 9. In a small bowl, mix vinegar and baking soda. Add cake batter and stir well to combine. 10. Working quickly, divide batter evenly between the cake pans and place them in a preheated 350 degree oven. 11. Bake for 25-30 minutes. 12. Cake is done when toothpick comes out clean. 13. Cool the cakes in their pans on a wire rack for 10 minutes. 14. Remove the cakes from the pan. 15. Allow cakes to cool completely before frosting. 1. Blend cream cheese and butter with an electric mixer until smooth. 2. Turn mixer to low speed and blend in confectioners sugar, salt and vanilla extract. 3. Turn mixer on high and beat until light and fluffy. May your day be sweet, dear friends! Would you like to share a recipe with us this summer?